Object-relational mapping is the process of mapping entities to relational database tables. In JPA, you perform object/relational mapping through mapping metadata. Mapping metadata uses annotations to describe how to link your object model to your relational model. OpenJPA offers tools to automate mapping and schema creation. See Chapter 7, Mapping in the Reference Guide. Throughout this chapter, we will draw on the object model introduced in Chapter 5, Metadata . We present that model again below. As we discuss various aspects of mapping metadata, we will zoom in on specific areas of the model and show how we map the object layer to the relational layer. All mapping metadata is optional. Where no explicit mapping metadata is given, JPA uses the defaults defined by the specification. As we present each mapping throughout this chapter, we also describe the defaults that apply when the mapping is absent. Mapping metadata is used primarily with schema generation. This metadata should not be relied upon for validation prior to communicating with the database. For example using the @Column(nullable=false) annotation does not do up front validation that the value in the entity is correct. The Table annotation specifies the table for an entity class. If you omit the Table annotation, base entity classes default to a table with their unqualified class name. The default table of an entity subclass depends on the inheritance strategy, as you will see in Section 6, “ Inheritance ”. String name: The name of the table. Defaults to the unqualified entity class name. 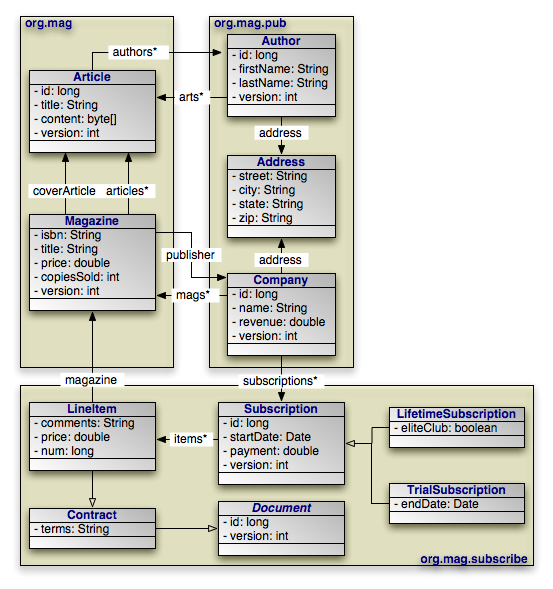 String schema: The table's schema. If you do not name a schema, JPA uses the default schema for the database connection. String catalog: The table's catalog. If you do not name a catalog, JPA uses the default catalog for the database connection. UniqueConstraint uniqueConstraints: An array of unique constraints to place on the table. We cover unique constraints below. Defaults to an empty array. The table element also accepts nested unique-constraint elements representing unique constraints. We will detail unique constraints shortly. Sometimes, some of the fields in a class are mapped to secondary tables. In that case, use the class' Table annotation to name what you consider the class' primary table. Later, we will see how to map certain fields to other tables. The example below maps classes to tables to separate schemas. The CONTRACT, SUB, and LINE_ITEM tables are in the CNTRCT schema; all other tables are in the default schema.